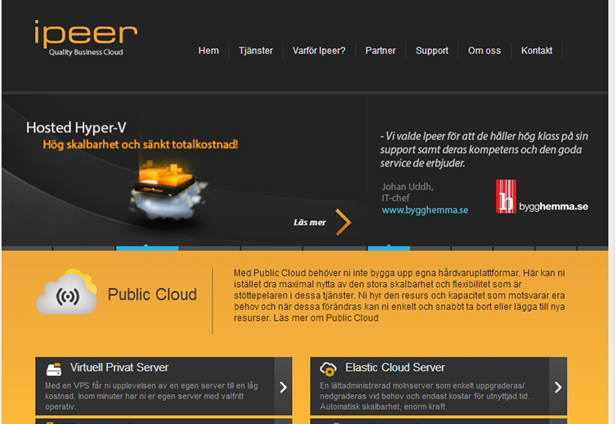 Swedish cloud provider Ipeer has launched a new Hosted Azure Pack based on Parallels new APS which offers a Microsoft Windows Azure service that is around 40% cheaper than similar services in Sweden. Ipeer, which is present in Karlstad, Stockholm and Bangalore, India, caters to a customer base that includes start-ups and large enterprises and organizations like banks. Founded in 2006, the company has 65 employees and aims to bring “thousands of new customers” to a Microsoft Cloud OS-based local cloud ecosystem that allows customers to extend Hyper-V server environments to the Ipeer cloud. Ipeer Hosted Azure Pack is one of 5 companies to have tested Windows Azure Pack, Windows Server 2012R2 and System Center 2012R2 with Parallels Automation and the new Azure Pack APS 2 (Application Package Standard). Once in the Ipeer cloud, users can migrate to another Hyper-V-environment and Windows Azure customers can move virtual machines to and from Ipeer. Do you know of any other companies offering new Windows Azure-based products and services? Let us know the details. Add your comments below.